If you’re looking for music, fun, and a little something to wet your whistle, then Willy D’s Piano Bar has exactly what you’re looking for. Located in Little Rock, Arkansas, the bar has some fancy titles to its name. Thanks to its two full-service bars, the Arkansas Democrat Gazette -- the local newspaper -- has christened Willy D’s as the “Best Bar in Little Rock”. On top of that, it’s long since become a hot spot for the night life in Little Rock. But that’s not all. The staff there put the “piano” in Willy D’s Piano Bar, with the number one piano show in The Natural State. It’s one thing to expect food and drink, but Willy D’s dueling pianos offer up something truly special. Customers can hang out, drink, and sing from the comfort of their chairs, while expert musicians play their hearts out on stage. Whether it’s a request, their take on the biggest hits in pop music, or just an old tune with new life in it, Willy D’s pianists can brighten up any night with a few quick finger strokes. The pianists don’t bring the smiles by themselves, though. They’ll pull other musicians into the mix, and put on a show with violins and band mates backing them up. Of course, they’re just as happy to get the audience involved. Willy D’s is a place that plenty of people visit to celebrate birthdays, bachelor parties, a simple worker’s night out, and more. The musicians can and will celebrate any occasion with style and a smile, whether it’s to call someone onto a stage or play a song that’s bound to get a laugh. They don’t even mind if someone climbs up onto the stage; they’ll just keep belting out the music. Matt Pruss and Matteo Ellis, two of the musicians of Willy D’s, aren’t just out to earn their paychecks for the night. Even if they’re sitting behind an instrument, they’ll do their part to make visitors feel less like mere customers, and more like family. The pianists have no problems keeping track of those that come to see them play, and they’re not shy about singing songs to specific visitors. They might even sing songs about those visitors. The number one piano show in the state draws the curtains every Tuesday through Saturday, starting at seven PM and ending at two AM. 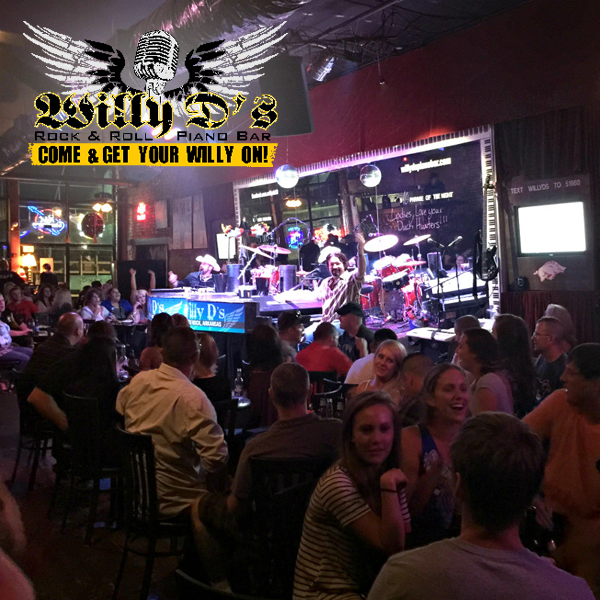 Those that feel like having a night of fun, whether they’re Little Rock locals or simply visitors from out of town, can rest easy knowing that Willy D’s Piano Bar can do the name justice. It’s a bar that’s perfect for impressing a crowd of people at once, or entertaining a band of friends. Heading to Willy D’s Piano Bar means you’re ready for its musicians to play the night away. 10 crispy fried chicken wings tossed in traditional hot sauce, garlic Parmesan sauce or lemon pepper, served with carrots, celery and a side of ranch dressing. Herb roasted chicken over fresh tortilla chips, smothered in our spicy cheese sauce and topped with fresh made pico de gallo, jalapenos and shredded cheddar. Served with a side sour cream. A huge pile of seasoned fries topped with roasted chicken and smothered in spicy cheese sauce. Hand battered giant shrimp, deep fried and tossed in a spicy aioli. Awesome! A blend of cheese and fresh herbs, served with tortilla chips. Choose between 2 fresh baked Bavarian pretzels or 2 jalapeno cheese stuffed pretzels, served with hot mustard or cheese dip for dipping. A spicy cream cheese, artichoke hearts and spinach concoction. Served with fresh pita chips. Eric’s secret salsa recipe with a blend of fresh cilantro, tomatoes and spices. Served with fresh fried tortilla chips. 1/2 Lb. of lean beef topped with bacon, white cheddar, shaved red onions, baby field greens, tomato and herbed mayonnaise, served with Parmesan fries. Smoked turkey breast grilled with bacon and Swiss cheese served on fresh sourdough bread with lettuce, tomato, herbed mayonnaise and Parmesan fries. Seasoned chicken breast grilled and topped with fresh avocado and hot pepper cheese served on a toasted bun with lettuce, tomato, southwest mayonnaise and Parmesan fries. Fresh baked sourdough bread grilled with Brie and Swiss cheese, sauteed shrimp, tomatoes and Parmesan fries. Pan seared beef tenderloin on a bed of mixed greens topped with shaved red onions, grape tomatoes, blue cheese crumbies and red wine vinaigrette. A seasoned grilled chicken breast served on a bed of mixed greens, with cherry tomatoes, fresh avocado, shredded cheddar, croutons and your choice of dressings.